Questions to Consider When Selecting a Crane | EMH, Inc. When you are looking for an overhead crane there are obvious things to consider including the overhead crane’s lifting capacity, the space needed for the overheard crane, and the crane that’s right for your facility in terms of size. What are the safety considerations of the overhead crane and will the overhead crane increase safety? What am I doing with the overhead crane? How critical are the materials we’re moving? How can an overhead crane potentially increase our effectiveness? How frequently will the overhead crane be used? What is the maximum capacity you can anticipate needing for future overhead crane needs? What motion will the overhead crane need to achieve to move your materials? How permanent is the overhead crane you choose and will it need to be moved down the line? What’s your budget for an overhead crane? How much money will an overhead crane save you in terms of efficiencies? 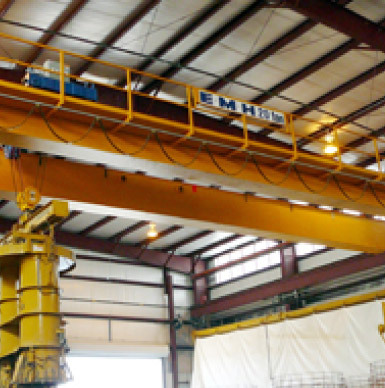 Overhead cranes, gentry cranes, bridge cranes, and workstation cranes are all offered by EMH – we would love to dive deeper into answering your questions and helping you determine the right overhead crane for you.